In cooperation with Apple computers and HP, The Launch Pad is pleased to offer the Golden Apple Program to help bring seniors to computing and computing to seniors. Designed for senior centers and living providers, this program is available to assisted and independent living facilities throughout Florida. The Golden Apple Program delivers an installed and ready-to-operate wireless Mac computer lab called a “MacPac” to your facility. 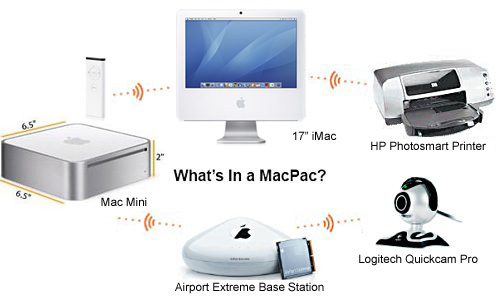 The starter MacPac includes 2 (wireless) networked 17” iMacs or Mac Minis, printer, Webcam, all software installed and unlimited e-mail accounts for your facility. Setup & training are provided. Easily installed in club houses or activity rooms, your residents can immediately enjoy the benefits of e-mail, Internet, digital photography, color printing and many other computing tools in an easy-to-use platform. MacPacs can be customized to meet the needs of your organization. For complete program information, contact Sales 813-448-1700 ext. 202. • Only 1 in 5 people over age 70 have ever used a computer. Only 15% of people over 70 can access the Internet. • One in 10 seniors who do not have Internet access at home or work say that they sometimes access the Internet from another location such as a friends’ or relatives’ house or a public library. The Golden Apple Program can help you attract new residents, improve the quality of life for those residents and make strides toward closing the gap in the digital divide. E-mail/Webcams offer an excellent communication tool for keeping in touch with family/friends. Access to new skills and activities increase engagement, interest and mental acuity. All Macs come with accessibility settings for accommodating special needs. Use the Web to keep up with current events, research health topics and gain access to the vast resources of information available on the Internet. Interact online with other seniors through bulletin boards and chat groups. Share experiences with young people by participating in the many classroom programs that connect students and seniors. Enjoy games like solitaire, chess, majong and bridge. Record oral histories, research genealogy and create family trees. Use the digital camera to easily take and share photos with family and friends via e-mail or PhotoSmart color printing (the digital camera can send pictures directly to the printer). Research pricing and shop online. Send gifts to family and friends. A ready-to-operate computer lab with low maintenance, easy-to-use Apple computers. The Golden Apple Program is an excellent marketing tool to draw residents to your facility or organization. The program also offers a unique public relations tool to build good will, involve others in the community and gain exposure for your facility by sharing your success stories. As a Golden Apple Project member you’ll have full use of our marketing materials for your Website, brochures and other marketing venues for your organization. We can train your activities director, work with your IT department and offer an easy-to- follow program for getting your residents involved and enjoying their new computer lab. Apple computers are known for their reliability, ease of use for the newcomer and excellent support. As a local, community-based organization, The Launch Pad can offer service, support and an onsite presence when needed to insure your computer lab and technology program functions smoothly. • Domain Name setup and 50 e-mail accounts for your facility using the domain of your choosing (additional accounts can be added upon request). • Installation, preconfigured network and wireless setup plus 1 year Manufacturer Hardware warranty (**extended AppleCare Protection available). • All software included and preinstalled.